From I-95 take exit #45, which is also known as Glades Road. From Florida Turnpike take exit #75, which is also known as Glades Road. Go east, towards the ocean, on Glades Road and make a left at the 1st FAU entrance (West University Drive). Once on campus turn Right onto Indian River Street then turn Left onto Dade Avenue. Metered parking for visitor is on the left (LOT 18); located on the south end of the Student Support Services building (also known as SU 80). 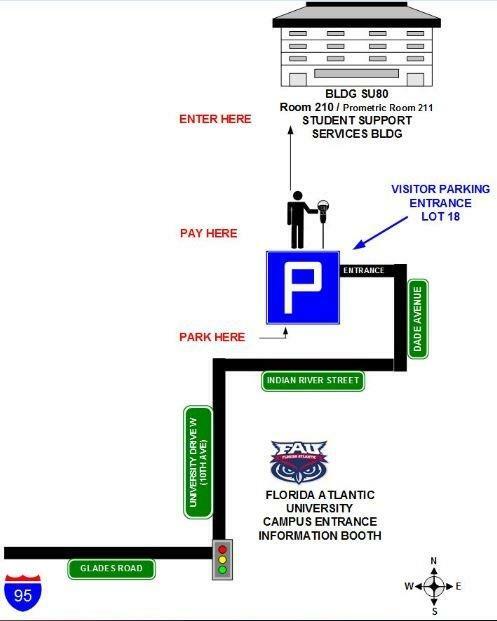 If you do not have an FAU parking decal you must park in the LOT 18, Metered parking lot. All visitors must pay to park at FAU. FAU Parking and Transportation Services. Visitors will now pay by plate. Pay by Plate takes three simple steps. Customers park, walk up to the nearest Pay by Plate machine, punch in their license plate number, and make their payment. This new technology will also allow parking enforcement officers to scan a license plate and immediately view their paid/unpaid status. Site Address: 777 Glades Road, Boca Raton FL 33431 Building Student Support Services SU 80 suite 210. If you do not have an FAU parking decal you must park in the metered parking lot. Click on map for direction to our building - Map. Visitors are required to purchase a visitor parking permit online before coming in to test. 4. Once logged into the parking Account, choose Purchase Permits to begin the process. 5. At the end of registration, your license plate will be registered. You can obtain turn by turn directions from Google Maps. If you do not have an FAU parking decal you must park at the metered parking.